Víctor Erice’s second feature, shot 22 years ago, ten years after his first, El espíritu de la colmena (The Spirit of the Beehive), took as its starting point a 47-page story by Adelaida García Morales that was published two years earlier. I’d recommend reading it after watching El sur, mainly because its last 12 pages allow us to imagine how the film would have developed if Erice had been allowed to shoot his adapted script in its entirety (the story originally concludes in southern Spain). For reasons never sufficiently explained, or openly discussed – though I do have a theory of my own about these complex, deep motivations – the shooting of El sur was halted, allegedly for the Christmas holidays, never to be resumed. Perhaps naïvely hoping to finally be allowed to shoot a second part – which was never intended as such or to be a separate movie – Erice kept diplomatically quiet, and edited a coherent film from the material available to him; it was sent to the Cannes Film Festival where it was hailed as a masterpiece, and the second part was silently but definitely shelved. Since it is useless to lament what is not there, one should act realistically, and see that there is much that is of the greatest beauty on the screen, much more than one can usually find in most fully realised films. Since it was not cut, there is no more footage to be found, nothing to search for. It is a half-realised project, or a partly unrealised one. El sur does not tell a particularly extraordinary tale. But the tale it does tell is rendered in quite original and moving ways, and in tones much more subtle and deep than its literary source. This does not mean it is a contrived, sophisticated, obscure or intellectual movie, even if it avoids sentimental trappings or “easy-to-make” political readings. El sur, as it is, tells of a young woman who recalls her father’s mysterious figure and fate, trying to understand why he acted as he did. Estrella is played as a young girl by Sonsoles Aranguren, and then, as a teenager, by then newcomer Iciar Bollaín, who became a well-known actress and now is also a director. Both girls do not really resemble each other, but we can believe they are one and the same character since they have been directed with respect to how growth can affect character and gestures. Both are so good and convincing that one does not miss either in corresponding scenes. From the opening sequence – in my recollection the most impressive since Dreyer’s Ordet (1964) and Ford’s The Searchers (1956) – one gathers that everything in this picture has been thought through and carried out with extreme care and precision; that there can be no loose ends, only cut threads owing to the film being only half of what Erice intended at over three hours. If the South announced in the film’s title remains a felt, mythical presence, almost dreamt but never reached or seen (only glimpsed on postcards while accompanied by the chords of Enrique Granados’ piano music on the soundtrack), it nevertheless remains a key reference, a significant motif in the film’s narrative. Although uncompleted, El sur is a much more accomplished, richer, deeper, complex and moving picture than El espíritu de la colmena. It marks a decisive step forward in Erice’s progression as a filmmaker. El sur is much more dense and allows us to get much nearer to several of the characters; its silences are not of the same kind as those that are so significant in El espíritu de la colmena. There is more interaction, and much more feeling and confrontation too, in El sur. In contrast, most adults in El espíritu de la colmena, even the parents – who never exchange a word – are kept mainly at a distance, in a different, separate world from that inhabited by the two sisters who are so alone that they are ready to see ghosts. The relationships in El sur are more real and painful. El sur reveals Erice’s increasing ability to cut directly to the essentials, without rejecting, in the process, spontaneity or humour, or any of those picturesque traits that can give life to even the most briefly shown characters. The key to his way of looking at things and showing them is rhythm. Things are shown to us at a very quiet and deliberate pace; not slow – there are not dead or void spots – but at a pace that simply allows us to look attentively at the players’ faces and read into them, so as to guess their deepest feelings. Although El sur doesn’t truly resemble Jean Renoir’s The River (1951), they do share the same kind of “breathing”, just as, regardless of the absence of cinéphilic “quotations” in Erice’s film, there is something in the shot/reverse-shot scenes between couples – usually Estrella and her father – that recalls the pauses in such Nicholas Ray films as They Live by Night (1948), In a Lonely Place (1950), The Lusty Men (1952), and Rebel Without A Cause (1955). The almost whispered, confidential tonality of Erice’s narration, which avoids explanations as well as set-pieces, only heightens our concentration on every word, every gesture, every gaze: few films have more elegantly invited us to think about what one is looking at in every shot, whether it is of rather short duration or an improvised-on-the-spot, second-best alternative to a sequence that should have been set and shot outdoors in the month of May (in this instance there was no time or light available when it was actually filmed, in late December after a snowfall, so Erice shot the whole sequence in a single, continuous crane movement, with Estrella and her father dancing to a pasodoble). 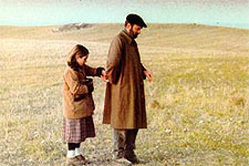 It is one of the most unforgettable moments in the whole film, encapsulating the then mainly wordless relationship between the young girl and her rather mysterious father in such a way that it is instantly recalled when, years later, during their last conversation, the same piece of music is heard in a restaurant.